Medicaid or Maryland Children’s Health Program (MCHP) coverage is free or low cost health insurance coverage for those who fall below a certain income range. 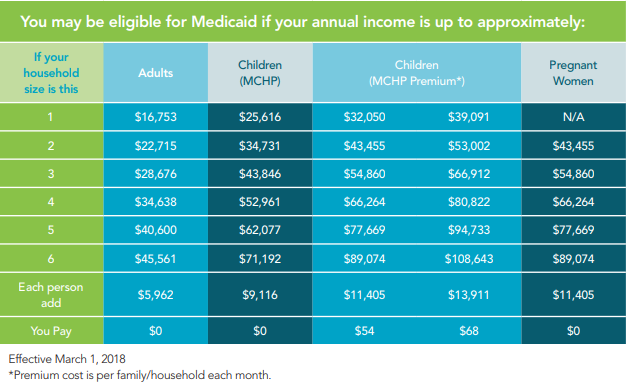 Check the chart below to see if you may be eligible for Medicaid, based on your income and family size. Your children or other members of your household may qualify even if you don’t. I received my red and white Medicaid card in the mail. Now what? Take this card with you when you visit in-network doctors. If you haven’t received your Medicaid card yet, you can still get medical services by using your Medicaid number. Once your application is complete, including all outstanding verifications, you may be able to select your Managed Care Organization (MCO). We recommend calling your doctor’s office to ask what MCO they accept, or use our search tool to find a doctor who takes the MCO you’d like to select. This way, you’re set to seek medical care when needed. You may select an MCO within one day of eligibility confirmation. If you are unable to choose an MCO, the state of Maryland will choose one for you. If you are selecting an MCO for the first time, or if the State automatically assigns you to an MCO, you may request a change in your MCO. This request may be made after 10 days, but must be made within 90 days. If you do not change within 90 days, in most cases you must remain with your MCO for 12 months before you can change again. You also may change MCOs in select circumstances, such as combining all household members or children into the same MCO, or if you moved and your current MCO does not provide service in the county where you now live. If you have a baby while you’re enrolled in an MCO, the baby will be automatically enrolled in your MCO and must remain in the assigned MCO for 90 days. What benefits do I have through my MCO? Dental care is free for children and pregnant women enrolled in Medicaid and MCHP. Adults may have limited dental coverage through their MCO. Tell us about any changes in your income. This step is vital to ensure you have the right plan for you and your family. Tell Maryland Health Connection right away if you have any changes in your household or income. To update your online application, login to your account at MarylandHealthConnection.gov, or call us at 1-855-642-8572. Deaf and hard of hearing consumers may use Relay for assistance. You may also find free, in-person help in your local area from a certified navigator or authorized producer at MarylandHealthConnection.gov/help. You should also report changes such as a new address or phone number, changes to your name, or corrections to your name, date of birth, or Social Security Number, even if those changes don’t affect your eligibility. Learn more at MarylandHealthConnection.gov/lifechanges.